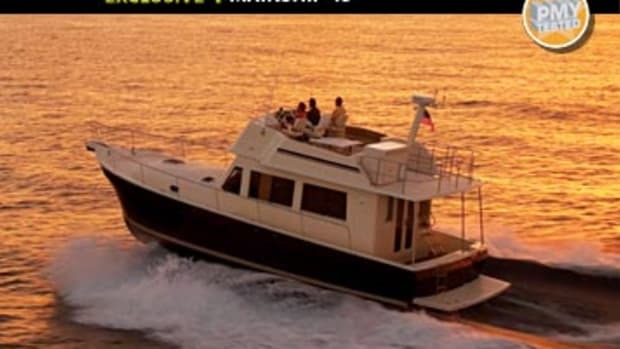 Next time you&apos;re hanging at the ol&apos; waterfront watering hole and feel like stirring things up, drop this on your buddies: "Power & Motoryacht just tested a 43-foot trawler that did 27 mph." 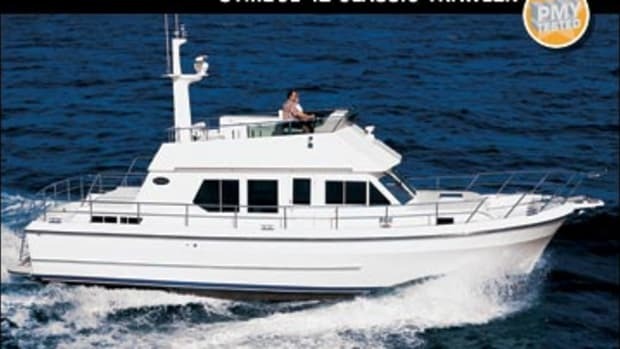 At least one guy will look up from his brew and declare that no trawler could possibly go that fast because, as everyone knows, trawlers are displacement boats limited to hull speed, which for a 43 is something like 7 knots. He is right, although technically a trawler is any boat that drags—or trawls—something. What he doesn&apos;t know is that the boat in question is the Mainship 43 Trawler—with a capital T. To Mainship, trawler is not a type but a model name. As for hull form, the 43&apos;s, like all her sisterships&apos;, is semidisplacement, so while she doesn&apos;t technically plane, she can, given sufficient power, exceed hull speed. 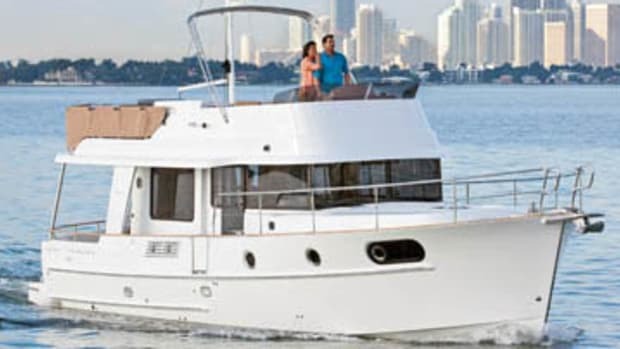 Our test boat certainly had the power: twin 540-hp Cummins QSC8.3 V-drives, which at 27.5 mph didn&apos;t generate the fuel efficiency (0.43 mpg) one normally associates with the term trawler. 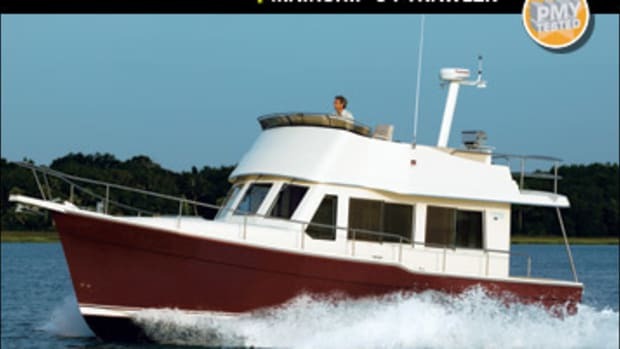 But the beauty of the semidisplacement hull is that if you can limit your speed to, say, 10.3 mph (still better than a "trawler"), you&apos;ll be rewarded with trawler-like efficiency: 1.07 mpg. Giving you that choice is what Mainship is about. The 43 is the largest Mainship and the only one offered just with twins. Conversely, the smallest model, the 30 Pilot, comes with only a single. Every other Mainship can be had with a single or twins. Some 90 percent are bought with singles, which tells you something about the Mainship customer—they&apos;re thrifty. 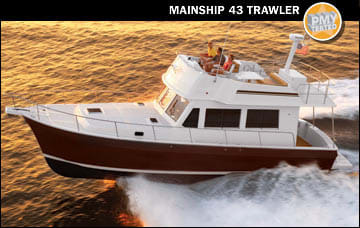 The Trawler is also one of three 43s—including the 43 Aft Cabin introduced five years ago, of which more than 100 have been built—and the new Pilot. 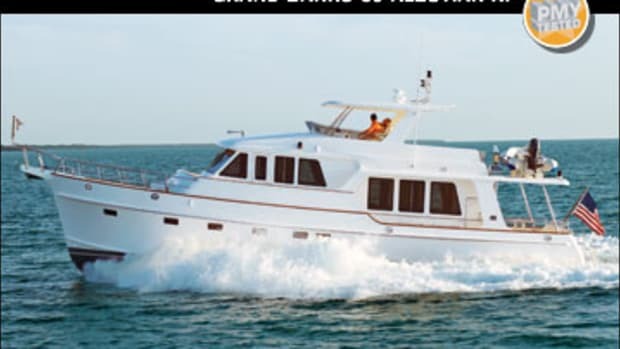 My 43, equipped with genset, electronics, colored hull, three LCD TVs, Bose 3-2-1, inverter, washer and dryer, and more, came in under just $700,000. (The Cummins are a $50,000 upgrade over the 440-hp Yanmars.) That doesn&apos;t get you marble, teak, Stidd chairs, and Sub-Zero &apos;fridges, but it will get you quality equipment and smart design. A big 15&apos;6" beam allows for an expansive saloon and wide side decks covered and protected by high bulwarks. It also makes for a master with enough space that three of us could stand in it without feeling crowded. Indeed, it&apos;s nearly two feet from the aft bulkhead—basically one huge, two-level hanging locker accessed via two doors, plus three drawers—to the seven-inch-thick memory foam mattress, the after end of which lifts for stowage. The lone head has a medicine cabinet large enough to be a linen closet plus an enclosed tub/shower. Okay, the tub&apos;s only about four feet long and tapered at the foot end, but when&apos;s the last time you were on any 43-footer that had a tub? The guest stateroom is really innovative. 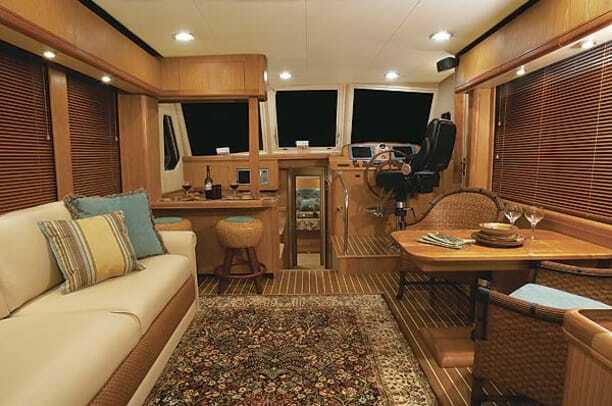 It has double doors, which when open make it feel more like an alcove, and a settee outboard with a compartment for a side-by-side washer and dryer at one end and a small desk at the other. So the space works as either office or den. The settee is big enough for one person to sleep on, but slide out the stowage compartment in its base, lay the back cushions atop it, remove the back against which the cushions lay, and you have a bigger-than-full-size berth. Removing the back is a real chore, but Mainship&apos;s working on a version that&apos;s easier to work with. The galley has tricks of its own. 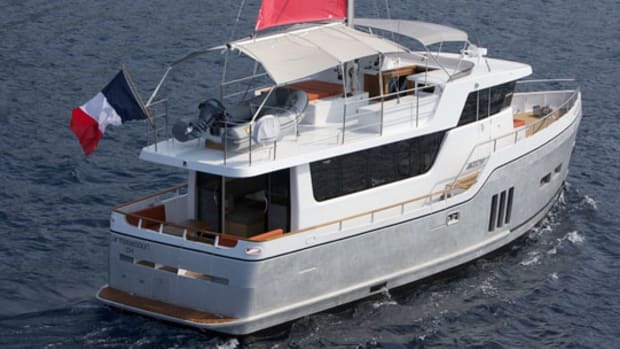 U-shape for safety and open to the main deck, it has facing pairs of stainless steel drawers, two refrigerators, and two freezers. No, they aren&apos;t those famous-name ones, but these can run off either 12 or 120 volts. 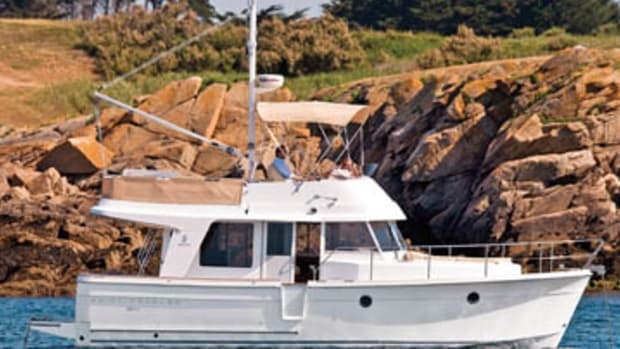 There&apos;s also a double stainless steel sink, lots of Corian counter space, cutlery and dish stowage, a pantry, in-sole dry stowage, and an outboard compartment with two trash receptacles, one for regular trash, one for recyclables. An eating bar with two stools separates the galley from the saloon; it&apos;s the right height for the cook, but I found it too low to sit at comfortably. The neatest things about the lower station are the door to the starboard side deck, making this a great short-handed boat, and the three huge 3&apos;x4&apos; windshields. Combined with the adjustable Devine Industries helm chair, you get great visibility on all points. Our interior sole was covered in an optional ($5,707) glossy, teak-like laminate called Everwear, reportedly more durable than teak and holly. The cockpit, at 4&apos;7" long, is tight for a table and chairs. Personally, I&apos;d wait for the Pilot version, with a saloon bulkhead about a foot and a half forward and a saloon smaller than the Trawler&apos;s 11-foot-long one. My boat&apos;s cockpit sole was covered in an optional tan plastic material called FlexiTeak. It&apos;s durable, can be sanded, and has good nonskid properties, but no one will confuse it with teak. The entire cockpit sole can be removed relatively easily for major work, but most of the time you&apos;ll access the lazarette and engine room via a 2&apos;x3&apos; cockpit hatch. Inside there&apos;s great access to everything, even the outside of the engines, thanks to that beam, and headroom&apos;s not bad: 4&apos;6". Seacocks on the port and starboard raw-water pickups allow the engines to draw from the bilge in an emergency. (There&apos;s also a 4,000-gallon bilge pump and alarm activated by high water.) A Racor fuel-polishing system is standard (! ), as is a sight gauge on the 830-gallon fuel tank forward of the engines—although that could change. Which brings me to performance. Perhaps the 43&apos;s most noticeable running characteristic is her bow-high attitude. I measured a maximum of seven degrees at 2000 rpm, enough that you need to run with the tabs halfway down—not a good thing. 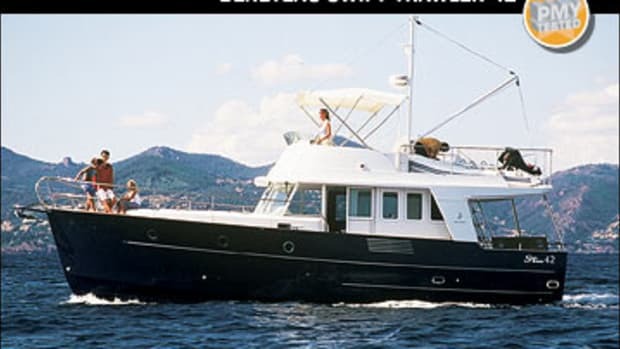 I suspect this attitude results from Mainship using the same hull as its 43 Aft Cabin, which has straight inboards. 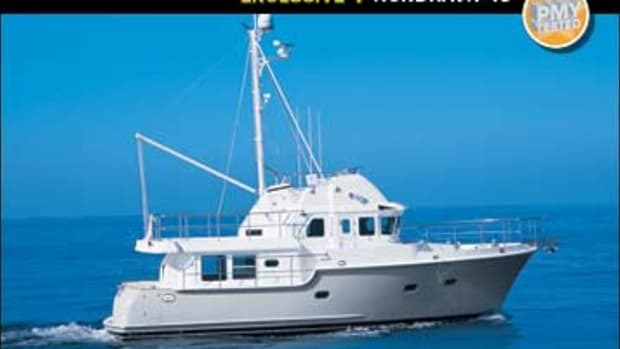 The Trawler, being a V-drive, has a center of balance considerably farther aft. Mainship intends to remedy the problem by shifting some gear forward and dividing that single fuel tank into three—two forward of the engines that will gravity-feed a centerline main tank—which is why that sight gauge will need to be rethought. The 43&apos;s other noticeable running characteristic is her steering: slow and heavy, it takes a lot of fun out of what proved to be a fine hull on test day, easily chewing up four-footers. Neither the steering nor the running angle was a problem at displacement speeds, where the 43 handled flawlessly without a bow thruster. Which made me think that maybe deep beneath her shiny fiberglass there really beats the heart of a trawler—that&apos;s with a small t.